Hello, my name is Amy and I am the new Long Term Volunteer here with the South Lakes team. As part of my degree at Aberystwyth University I have to undertake a placement in a relevant industry to my chosen degree of Countryside Management and Conservation. Even though I have learned a lot in lectures the time I spend with the National Trust will be just as important if not more, putting what I have learned into practice as well as increasing my knowledge of key practical skills. 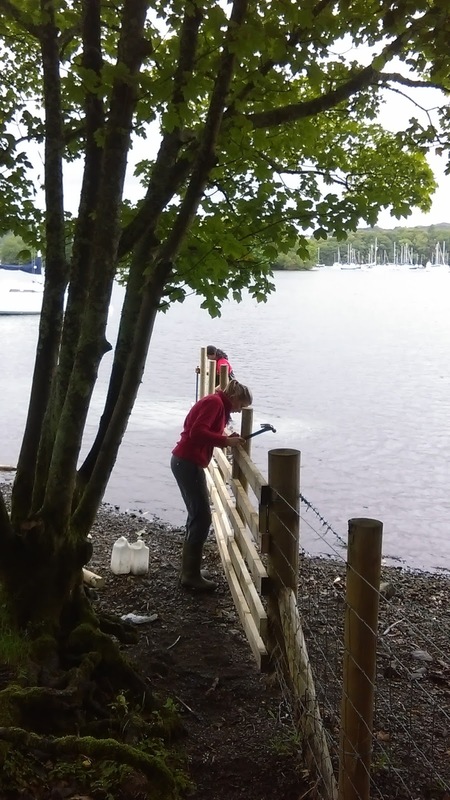 Having worked in the Coniston area for the last month I have now moved over to the Hawkshead side where we are currently extending fences into Lake Windermere. These fences are not to exclude people from areas of land (step stiles have been added for access) but instead cattle. Cattle can prevent natural regeneration of woodlands from occurring by grazing off young shoots from the trees. Currently the under story of the trees is pretty bare, with the extension of the fences these shoots will be allowed to grow and an understory can develop. However extending fences into a lake is not as easy as it seems, firstly working in water is much harder than working in bare ground as very quickly the water loses its clear appearance and becomes slightly cloudy with the disturbance of the ground. Secondly there are many rocks in Lake Windermere, all of which affect how easily or straight it is to get a post into the ground. 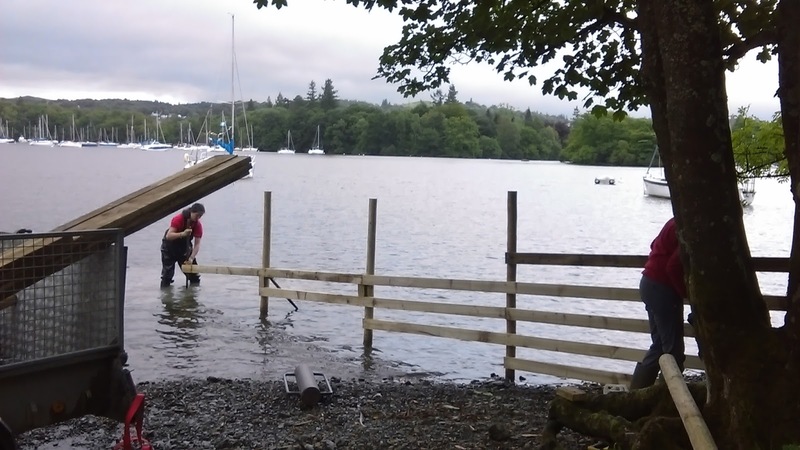 Finally once the posts are in the ground and up to the wobble test it is time to attach the rails; for the majority this was the easy task but hammering in water is a new and weird experience. For this fencing task waders were a must as we all found out! 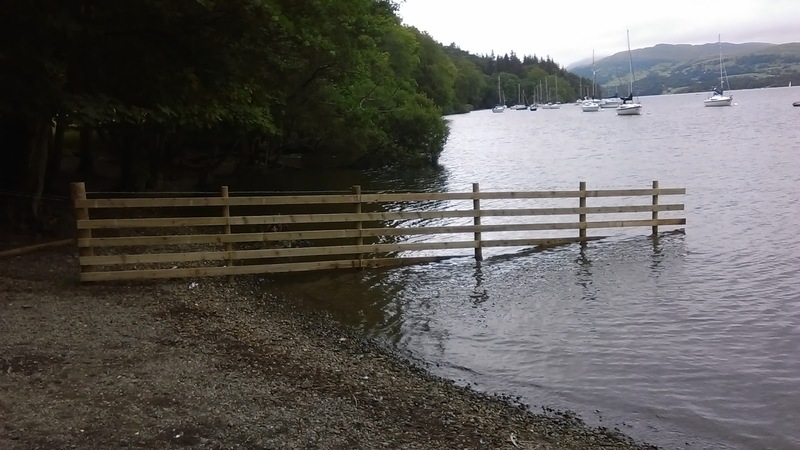 The completed fence into the Lake. Why are you chopping down the trees? This is a common question we get asked whenever we're tree felling. In fact the landscape we see today may look natural, but it has been shaped over many centuries by the people that have lived and worked here. The woodlands were a vital resource for the local iron, leather and bobbin-making industries, as well as providing timber and firewood. Woodlands in Britain were historically managed by Coppicing. The word coppice comes from the French word ‘Couper’, meaning to cut, a method which involves cutting down trees and allowing them to re–grow from the stumps, known as stools. 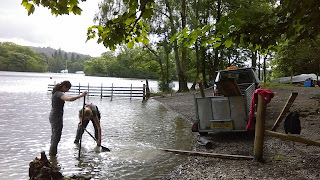 One of our conservation projects this year has been at Hoathwaite, near Torver, which is a National Trust campsite and a tenanted farm managed by Sam Inman. This project has been to improve and protect biodiversity and water quality. The start of the project saw the team coppice the alder trees along the stream edge, not only to maintain local traditions but to allow the dormant ground flora a chance to thrive without the shade from the trees. We then had a local contractor double fence the entire length of the field along with a nice new stock crossing. The tenant farmer Sam Inman allowed us to set back the fence from the beck to create a “buffer zone” protected from grazing stock. This provides places where plants can grow up, providing more cover for birds, insects and small mammals and helping to consolidate the banks with their root systems and prevent bank erosion alleviating siltation. Since the fence line has been erected the ground flora has started to thrive, with species such as Ragged Robin, Common Birds-Foot Trefoil, Meadowsweet, Sheep Sorrel, Marsh Willowherb, Red Campion, Meadow Buttercup, Common Marsh Bedstraw, Common Mouse-ear, Yellow Pimpernel, Red and White Clover to name a few. Without the generosity of our donors we would not be able to carry out important and beneficial projects such as this. Thank you for your support to enable us to continue our conservation work.